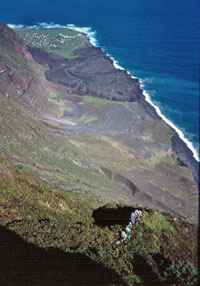 Pigbite is the barren area between the 1961 volcano and Big Point, and is linked to the settelement by a road over the lava. 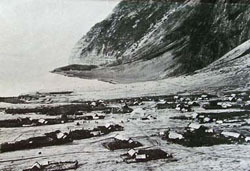 Pigbite is the area between the former Big Beach (seen on this 1950s photograph below) and Big Point. The 1961 lava field covered most of Big Beach and today the area east of the lava is generally known as Pigbite. It is a barren place, with only scant sheep grazing, but it is the best lowland place to pick island berries in summer and wild vines can be found on the lower flanks of Plantation Gulch. The photograph right, shows the Big Green Hill Sheep Gang taking a sheep to join the growing mountain flock in 1982. The sheer path, almost hidden in the vegetation, is nevertheless known to the locals as a 'road'. From the sea the 1961 black lava forms low cliffs to the right (west), Big Point is the cliff to the left (east). In between the rocky scars show where gulches disgorge their loads, bouncing down the cliffs. 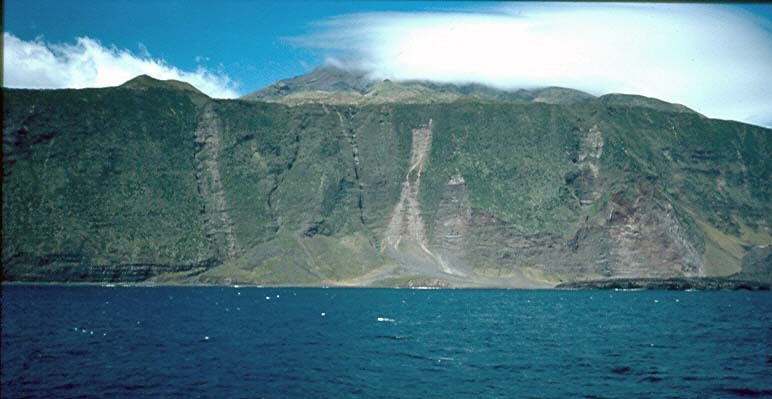 The cliff sides are very unstable and landslides often occur in this area.The path (or 'road' as islanders always refer to paths) used to reach Big Green Hill (showing its cone silhouetted against the skyline) is only a foot or so wide, invisible from this sea view and only for the fit and sure-footed. 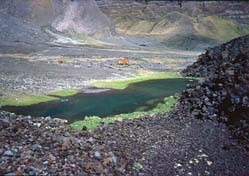 Nevertheless Pigbite has the luxury of being linked to the Settlement by a road over the lava and can be reached by vehicle. When the 1961 lava cooled this area was a sea inlet until longshore drift created a bar beach and this lagoon. Used by Tristan youngsters as a safe swimming and boating lake in the 1970s and 80s - the lagoon was gradually filled in with stones and sand from Caves Gulch, and by pebbles and boulders tossed over the beach by northerly storms. The lagoon disappeared altogether by the 1990s.